Some householders in Worcester Park will have received leaflets from Sutton Council proclaiming the exciting news that glass can now be placed with the rest of the recycling in the green bins. This means that the lovely blue bins which we were given last year are now effectively redundant. "I wonder what Sutton Council will be doing with the now redundant (fairly new!) blue bins. Will they recycle them......? Another waste of our council tax money....."
The start of a new feature, perhaps. 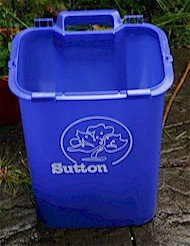 101 Uses For A Sutton Council Blue Bin.